June 2017 - Glass Surface Technology was pleased to contribute to the perfumers contest Corpo 35. Using its interior decoration’s know how, it applied a fine golden layer inside the trophies. ​February 2017 - Glass Surface Technology is proud to be part of Cosmopack Bologna in March. ​October 2016 - Great show at Cosmetic 360. ​A lot of interesting visits during 2 days ! 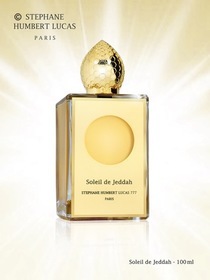 September 2016 - The perfumer artist Stéphane Humbert Lucas wanted to illuminate his last creation, Soleil de Jeddah. Glass Surface Technology applied a fine golden layer inside his perfume bottle, using its proprietary ISD© technology. On the main face, a window shows the coating and symbolizes the shiny sun. 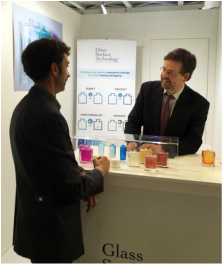 July 2016 - Glass Surface Technology is proud to be part of Cosmetic 360 in October (Paris Carrousel du Louvre). ​March 2016 - Great show at Cosmopack Bologna. ​A lot of interesting visits during 4 days and exciting projects to come! ​January 2016 - Glass Surface Technology is proud to be part of Cosmopack Bologna in March. ​October 2015 - Great show at Cosmetic 360, a lot of interesting visits! FDA's Authority on cosmetic products : Although cosmetic products do not need to be approved to go on the market, under the law, they must not be ¨adulterated¨ or ¨misbranded¨. Unlike for drugs, manufacturers are not required to register their cosmetic establishments, file data on ingredients, or report cosmetic-related injuries to FDA. However, companies are encouraged to register their establishments and file Cosmetic Product Ingredient Statements with FDA's Voluntary Cosmetic Registration Program (VCRP). In Europe, the new regulation EC 1223/2009 on cosmetic products applies from July 11, 2013 Article 10 requires a safety assessment of the product before going on the market, in accordance with Annex I. Annex I Part A requires stability testing during storage and useful purity information on packaging. Understanding the packaging stability, its composition and its behavior becomes even more important than before : for example, there are many different glass types and composition, stability may differ from one to the other.